It’s time to aggregate the data of the timelines of July (Part II and Part II) into (hopefully) meaning stats. Before drilling down into the numbers, a recommendation is necessary: I will never give up repeating that these stats are necessarily an approximation since the sample is very heterogeneous, and just like all approximations they could leave some shadow zones. An example for this month is represented by the tide of cyber attacks under the umbrella of #OpSaveGaza. I am not interested to enumerate all the single attacks (also because it would be virtually impossible), so this operation appears like a single entry in the stats. Of course you have any suggestion to cope with such similar situations, they are absolutely more than welcome. So, after this tedious, but necessary introduction, let’s rock with the data. The Daily Trend of Attacks shows quite a fragmented trend with a peak towards the end of the month. It is interesting to notice the general break during weekends. This probably depends on the collection methodology: when possible, if the information is known, I try to insert the date when the attack really happened, but in several cases this information is not available, so the reported date is the one when the attack was initially published in the news, which obviously happens less likely during weekends. 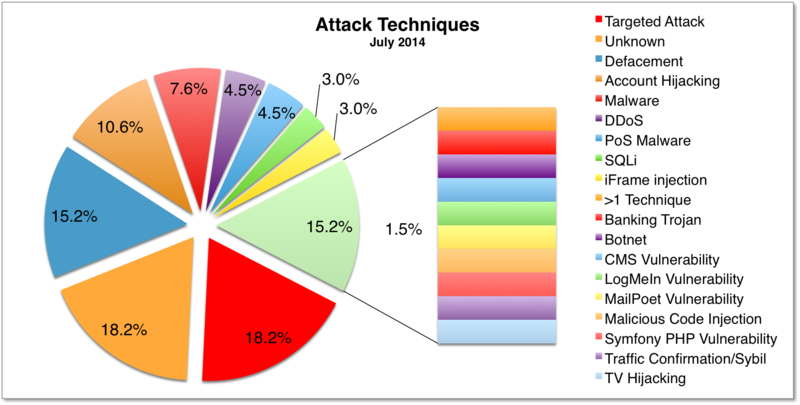 The Motivations Behind Attacks chart confirms Cyber Crime at number one with 59% of occurrences (a slight decrease compared to 65% of June). The staggering news is the resounding 18% of Cyber Espionage, confirmed the growing coverage for Targeted Attacks (they are almost always related to Cyber Espionage). Hacktivism is substantially stable at 23%, was 24% previous month). But the surprises continue! 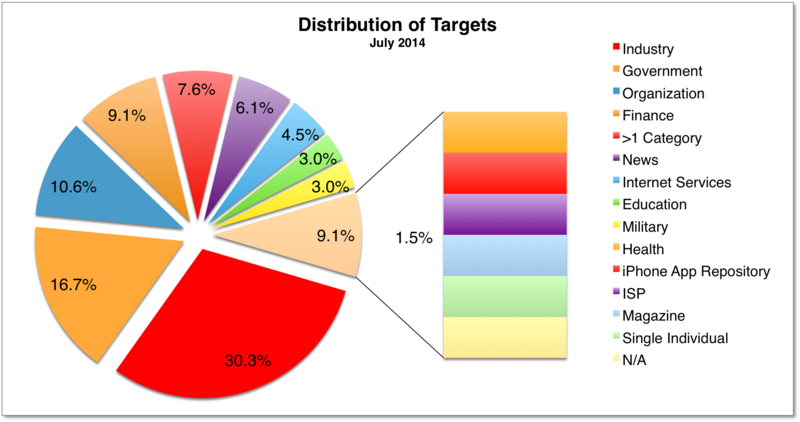 The Distribution Of Attack Techniques reveals an unprecedented 18.2% of targeted attacks, allowing this category to attain a deserved first place (shared with the category of unknown attacks). Defacement is immediately after (15.2%), while the other categories are further behind. It is also interesting to notice the decrease of DDoS and SQLi. Confirming the trend of the last months, Industry leads the Distribution of Targets Chart with 30.3%. Governmental targets rank at number two, 16.7%, well ahead of Organizations at number three with 16.7%. Values substantially in line with the ones of June. A detailed analysis of Industrial targets shows a predominance of targets belonging to E-Commerce, Tourism and Restaurant. While Non-Profit entities lead the corresponding chart for organizations. As I mentioned before and always repeat, please bear in mind that the sample must be taken very carefully since it refers only to discovered attacks included in my timelines. The sample does not pretend to be exhaustive but only aims to provide an high level overview of the “cyber landscape”, or at least of the ones that gained space in the media (yes, using an abused expression this is just the tip of the Iceberg). Additionally, if you want to have an idea of how fragile our data are inside the cyberspace, have a look at the timelines of the main Cyber Attacks in 2011, 2012, 2013 and now 2014 (regularly updated). You may also want to have a look at the Cyber Attack Statistics.